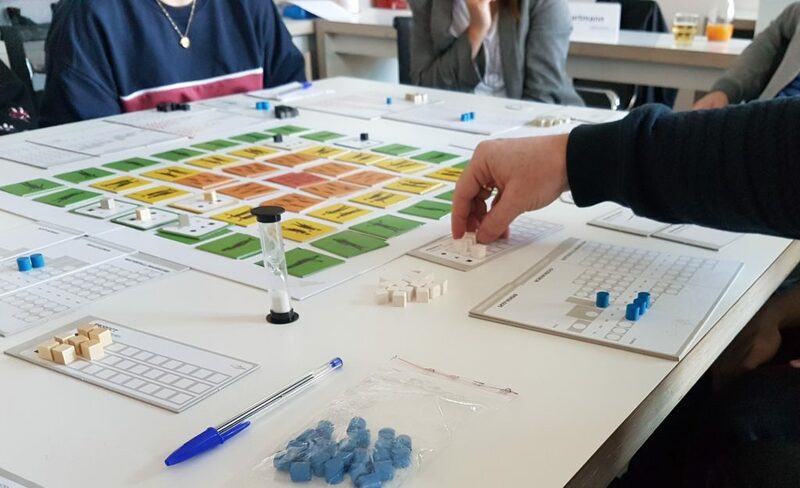 Playing Lean 2 is the 2nd generation of the proven serious game that teaches innovation and Lean Startup. In about 2-3 hours you can introduce your team to this methodology and help your organization to innovate. At LeanSP you can rent it for 49 € for one week including two-way shipping. Playing Lean is the board game where players face the hard choices of innovation without getting out of the building. It’s our flight simulator for Lean Startup, the safe place where thousands of entrepreneurs have learned to fly without risking their life savings. To create Playing Lean 2, its developers have partnered up with Alexander Osterwalder, inventor of the Business Model Canvas and one of the great minds of Lean Startup. Free two-way shipping to all EU countries. Recommended for intrapreneurs and startups. Works best with 4 to 16 participants. Game time: ca. 3 hrs. Newbie-friendly, no prior knowledge required. Including rulebook and hospitality scenario.